July 21st to August 5th, the Orbital gallery will hosting HUNG – An exhibition showcasing the work of David Ziggy Greene, an internationally acclaimed London based cartoonist. 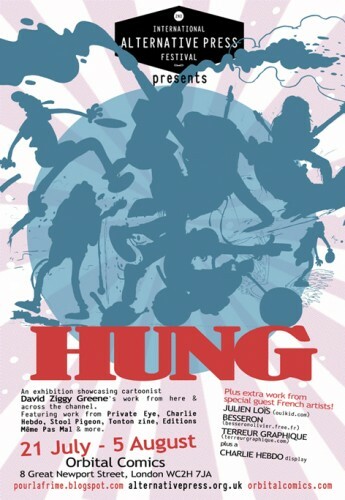 The exhibtion will include his samples of his illustrated journalism work for Private Eye magazine (UK) Charlie Hebdo newspaper (France), illustrated gig reviews for Stool Pigeon music paper (UK), zine work for Tonton zine (France) and Fanzine Helban (France). This event will also be featuring comic book pages from his recently published book Nager Avec Des Chaussures. All are welcome to come along to Orbital Comics on Saturday 21st July at 7 – 9pm to help launch the show as it opens to the public. It’ll be the place to be with booze, comic art, music and cool people!